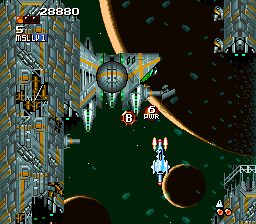 The Aleste series made its way to the SNES in a single outing, known as Space Megaforce in North America. 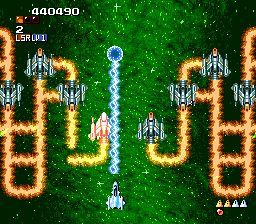 Compile used this opportunity to show off the SNES scaling and rotation effects to recreate the animation of the SMS Power Strike intro, with the fighting spinning and flying towards the screen. 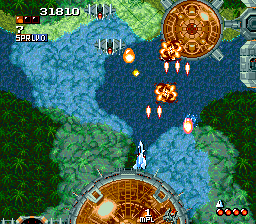 The game was published by Toho in all territories. 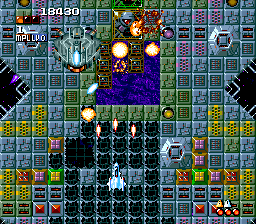 The story takes place separate from all of the other Aleste games, as a gigantic alien vessel called the Sphere comes from outer space and attacks Earth. 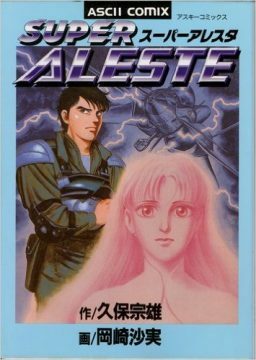 In the Japanese version, the Aleste ship is piloted by Raz, a human fighter pilot, and Thi, a mysterious prisoner of the Sphere who takes the form of a young girl and helps control the ship with her psionic powers. However, the English version cuts out almost all of this, renames the ship to the ED-057, and rarely shows the main pilot. 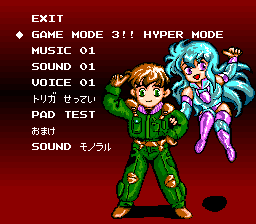 The option and continue screens show cutesy renditions of the main characters in the Japanese version, which were all but scrubbed clean for other releases. 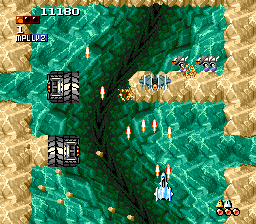 While it’s definitely an Aleste game, Space Megaforce feels strangely laid back. 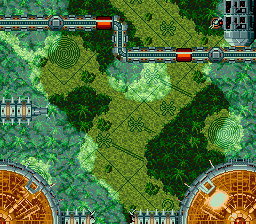 The scrolling is relatively slow, and many stages are now filled with environmental obstacles like walls, though you can touch them without sustaining damage. 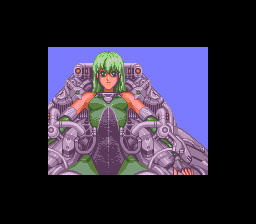 Even the music is weirdly relaxed for a shoot-em-up. 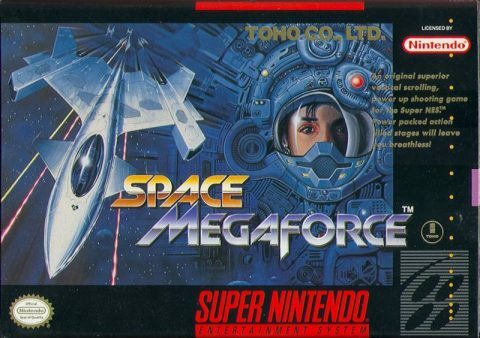 That doesn’t mean Space Megaforce is boring though, especially considering it has the largest arsenal of any of Compile’s shooters, save the later Zanac x Zanac for PS1. As usual, there are eight numbered weapons and each now has a three letter code on its orb, so you can better remember which weapon does what. There’s no main weapon, technically – the subweapons takes their place, though a standard forward firing shot is still used in conjunction with a few of them. Powering up these weapons is easier than ever, as there are yellow orbs that will slowly increase the power level of your weapon, rather than having to wait for the same-numbered orbs to show up. 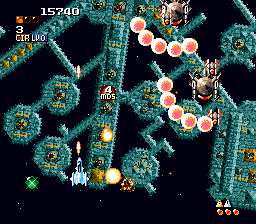 Each weapon can be upgraded to six levels, and all of them now have at least one alternate firing method, activated with the shot control button. 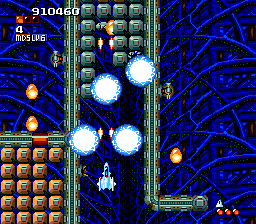 For example, the traditional multi-directional shot that’s been around since Zanac typically fires in the direction you’re moving, but activate the alternate mode and instead it’ll lock fire in a specific direction. For the rotating ball, it’ll stop the ball from spinning until you let you go. For the “Sprite“ Options, it will freeze them in place rather than following your movements. The laser here is about the closest Compile has ever come to reusing the awesome Field Thunder weapon from Blazing Lazers (though its patterns aren’t quite as elaborate) though it can be used as a homing beam in its alternate mode. All of this allows unprecedented versatility. There’s also a limited supply of bombs. On the default setting, the game isn’t too hard. The slow pace means you can saunter around most things, and your weapons can easily overwhelm almost everything if they’re sufficiently powered up. Getting hit knocks you down a few weapon levels, so if you’re strong enough you can take two direct hits before getting killed. 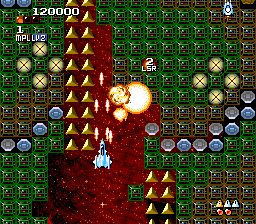 It re-uses the Blazing Lazers-style of resurrection, where you’re granted “gold“ ships that allow you resume immediately where you left off, but need to restart from a checkpoint if you run out. 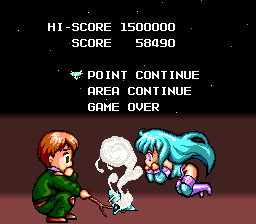 There are higher difficulty levels, but they just end up being more frustrating, by making enemies take more hits to kill, which is a pain with the weaker weapons. 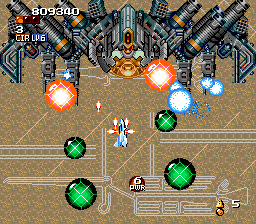 Additionally, there are also “tricky“ and “wild“ difficulty modes, where everything you destroy sends a torrent of targeted suicide bullets. 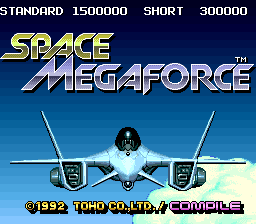 Even though the sci-fi theme might feel a little more generic than Japanese and fantasy mechas of the other 16-bit Aleste games, Space Megaforce is still a remarkably impressive looking title. The first stage takes place over a South American jungle with Nazca lines drawn far below, a reference to the original Zanac. 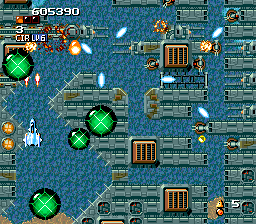 The second goes crazy with the Mode 7, as you slowly zoom in on a gigantic space station and slowly dismantle its turrets. 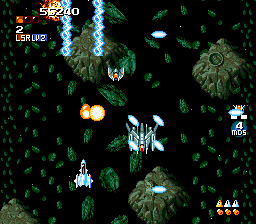 And another stage uses scrolling layered fields of asteroids giving a perception of depth. However, in the long run the game does become repetitive. 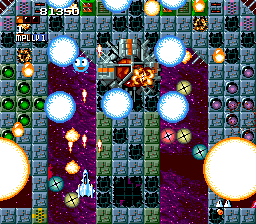 There are 12 levels in total and a few of them are just palette swaps of earlier levels with slightly different layouts. Since a full playthrough is about an hour, there’s also a Short mode, where you only play four stages. There are also multiple endings depending on the difficulty level, showing Thi and Raz in all sorts of everyday activities. 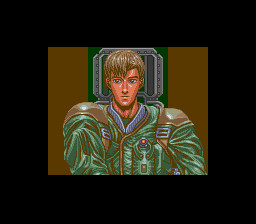 There’s just one ending in the English release, showing a generic fighter pilot guy flying away into the sunset. Some of the music is swapped around too, with the third/ninth level tune missing. The Japanese cover was also illustrated by Naoyuki Kato, who had also done the cover for Guardic Gaiden. 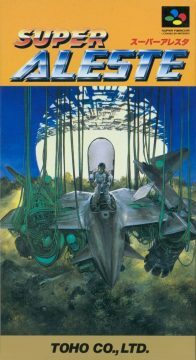 There’s also a single volume manga, published by Monthly ASCII and written by Muneo Kubo and illustrated by shoujo mangaka Sami Okazaki.